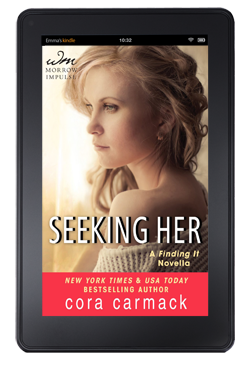 I have really enjoyed Cora Carmack’s Losing It series. It’s gritty and raw and makes you really fall into the lives of her characters. She doesn’t hold back or shy away from very real and serious issues, and she deals with “life stuff” that happens to actual people in a refreshingly redemptive way. That said, while I liked Seeking Her, I didn’t love it the way I have the rest of the series. I felt like the story ended too soon with too much information about Jackson Hunt before he meets Kelsey. I wanted more of his side of their interactions from Finding It which I feel would’ve made me understand his character better Just when I was getting into the story and wanting more, the story ended leaving me unsatisfied. All that being said, this was a good read. It was interesting and engaging and gave insight into Hunt’s character. I liked getting to know him a little bit better by being in his head rather than reading about him from Kelsey’s POV. So, while I like Hunt’s story, I wish there had been more so that I could have LOVED it. Disclaimer: There are some strong sexual themes in this book, alcohol use, and other adult themes. Not recommended for young teens. – Necessary? Nope, not at all. – Where does it fit? It starts before the beginning of Finding It and overlaps the beginning events of Finding It. – Prior Knowledge needed? It would probably be helpful.